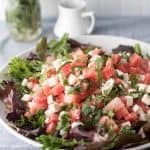 Juicy sweet watermelon, tangy feta cheese and little bursts of refreshing mint tossed in sweet white balsamic reduction. Combine sugar and vinegar in a saucepan. Cook on low for 18 minutes, stirring occasionally. Mixture should simmer but not boil and will burn easily if heat is too high. Let cool 5-10 minutes before using. Sauce will be slightly thickened, similar to maple syrup. Cut watermelon and feta, set aside together in a bowl. To chiffonade the mint, lay the mint leaves flat on top of each other. Roll tightly and slice in thin slices. Add to the watermelon and feta and gently toss together. In a large serving bowl, add spring mix and top with watermelon, feta and mint. *granulated sugar can be substituted. I like to use sugar in the raw for the slight caramel undertones it adds to the reduction.